Makalelerin tam metinlerine http://www.kefdergi.com adresinden erişilebilmektedir. All articles published in Kastamonu Education Journal are licensed with "Creative Commons Attribution 4.0 International License". This license entitles all parties to copy, share and redistribute all the articles, data sets, figures and supplementary files published in this journal in data mining, search engines, web sites, blogs and other digital platforms under the condition of providing references. Open access is an apporach that eases the interdisciplinary communication and encourages cooperation among different disciplines. 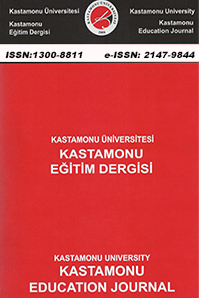 Kastamonu Education Journal, therefore, contributes to its own field by providing more access to its articles and a more transparent review process.